Robert “Butch” Freedman will be signing books at booth 39 at the Portland Book Festival on November 10th. A long-time writer and teacher, Robert “Butch” Freedman lives in Cape Meares, Oregon. Originally from Philadelphia, he has finally fully acclimated to life in the Great Northwest. He still roots for the Phillies, though. 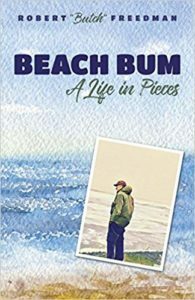 Butch published, the autobiographical novel, “Fancypants: An Autobiographical Novel” in 2008 and “Beach Bum:A Life in Pieces in 2018. His short prose works have appeared in numerous publications, including: Purple Clover, Drash, Tikkun, Philadelphia Stories, Still Crazy, Under The Gum Tree, Northwest Squid, and Portland Magazine. He has facilitated writing workshops for Write Around Portland (some at Inverness Jail), at Havurah Shalom and at the Multnomah Arts Center. Beach Bum looks at the many paths and people that go into the making of a life. It is a pessimist’s endorsement of hope and keeping on. In a series of connected personal essays, both humorous and deadly serious, Freedman traces his attempts to live a meaningful life. He writes about issues ranging from his rejection and later embrace of Judaism to dealing with hepatitis C to a return to surfing at the age of 70. Whoo hoo! Great to celebrate your stories.